DETROIT - Buick Motor Division's famous "tri-shield" emblem, basically three shields inside a circle, can be traced directly to the ancestral coat of arms of the automaker's Scottish founder - David Dunbar Buick. The value of the Buick logo was noted in the early 1990s in a study commissioned by a corporate identity firm, the Schechter Group. A study of the impact of corporate symbols, it found that consumers' opinions can be helped - or even hurt - by their logos. It further observed that "among car marketers, GM's Buick gained an astounding 53 percent in positive image with its tri-shield symbol." The description, not accompanied by a picture, was interpreted as a red shield with a checkered silver and azure (light purplish blue) diagonal line running from the upper left corner to lower right, an antlered deer head with a jagged neckline in the upper right corner of the shield and a gold cross in the lower left corner. The cross had a hole in the center with the red of the shield showing through. Buick Motor Division first used the Buick family crest as a decoration just above the radiator grille on its 1937 models, and it was a very close representation of the crest described in Burke's. The shield was "modernized" (made longer top to bottom and narrower in width) in 1939. It was modified again with classic heraldic symbols embellishing the top and bottom of the shield for 1942. That was a short model year because Buick stopped producing cars February 3, 1942, and then converted to World War II military production. the emblem with hood and grille styling. But the basic elements of the original crest were retained. By 1960, the logo had undergone a major revision. In place of one shield, a tri-shield appeared, representing the three Buick models then being built - LeSabre, Invicta and Electra (all introduced as 1959 models). Again, all of the original crest symbols and colors were retained, with the major difference being that instead of one shield, there were now the three overlapping shields in red, white (later silver gray) and blue. Buick hood ornaments in television ads. But by the late 1980s, management decided to re-emphasize the tri-shield, and so the hawk (and, not incidentally, the Buick Skyhawk car) was retired. Today the tri-shield is modernized in Buick marketing and advertising, emphasizing the outline of the original design. The buck's head and cross are gone, the diagonal no longer checkered. With the new see-through design, there are no longer colors in the shields. The Buick family crest, like the Buick nameplate, keeps alive the memory of David Dunbar Buick, who started a chain of events that gave birth to Buick Motor Co. and led to the creation of General Motors - the world's largest automaker. David Buick's memory was also honored in 1994 when Buick executives and officials in Arbroath, Scotland, dedicated a plaque near the site of his birth in Arbroath. David Dunbar Buick was born in Arbroath, a fishing village on the North Sea north of Edinburgh, Scotland, on September 17, 1854. His family (which used the "Buik" spelling in Scotland) moved to the United States when he was 2 and he grew up in Detroit. Buick, a plumbing inventor and businessman, began to tinker with gasoline engines around 1896, and the first experimental Buick horseless carriage was completed between 1899 and late 1900. His first automobile-related company, Buick Auto-Vim and Power Co., was probably formed late in 1899. That evolved into Buick Manufacturing Co. (1901 or 1902), Buick Motor Co. of Detroit in 1903 and Buick Motor Co. of Flint in 1904. In the fall of 1903, Buick Motor Co. was purchased by directors of the Flint Wagon Works in Flint, Mich., 60 miles north of Detroit. The company (which still included David Buick) began to build engines in Flint in December. In 1904, the first 37 production Buick automobiles were built. That November, Flint carriage maker William C. Durant, an energetic business promoter, took control of Buick. 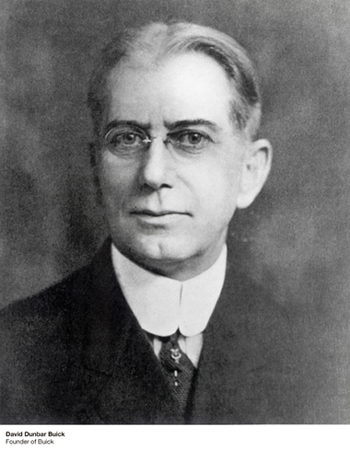 Four years later, in 1908, he used Buick Motor Co.'s success as the foundation for his creation of General Motors. That year, Buick claimed to lead the country with more than 8,000 sales. By the end of 1908, David Buick had left the company to pursue other business interests. He apparently prospered for a number of years, but at the time of his death in Detroit in 1929, he was said to be in near poverty. The first widely recognized use of the Buick name was a large brass cursive "Buick" that appeared on the mesh radiator grille of early models - but there is some confusion about how early. Of the 729 Model C Buicks built in 1905, 13 still exist and most of them are restored with that Buick script up front. But the script does not appear in most 1905 vintage photos of those cars. The only visible nameplate on early 1905 Buicks is "Buick Motor Company" in block letters on the front sill plates. A block-letter "Buick" appeared on running boards later in the year. Even earlier, a design used in the only known Buick Manufacturing Co. literature (a 1902 or '03 catalog) and in the first Buick Motor Co. catalog (1904), depicted Uncle Sam walking astride a world globe and pulling a Buick engine on a wheeled cart. The globe carried the slogan, "Known all over the world," which was quite a boast at the time. In 1911, an odd-looking Buick logo appeared with a giant "B" with the "uick" inside it. About that time, the famous Buick slogan, "When better automobiles are built, Buick will build them," also was introduced. The slogan lasted for decades but the awkward logo was soon gone. The Buick script framed inside (and overlapping) a rectangle dates to around 1913 and appeared on the faceplate of the standard Boyce motometer fitted to the top of the radiators of various Buicks prior to 1927. That popular logo showed up in grille designs well into the '30s. The script was also used inside a circle with "Authorized Service" in the border for dealerships and other service providers. Other Buick icons included hood ornaments. Some collectors say the Buick hood ornaments of the late 1920s were among the finest produced by the Ternstedt company of Detroit. They ranged from a goddess in 1927 to a figure 8 with wings (representing eight-cylinder power) in the early 1930s. "Gu. A bend chequy, ar. and az. betw. a Buck's head erazed in chief, and a cross couped and pierced, or, in base." In 1937, this is how Buick interpreted the above: "Gu" means gule (red), which is the color of the field. "A bend" refers to the diagonal bend from the upper left corner to the lower right. "Chequy" means checkered, referring to the design on the bend. "Ar." means argent (silver) and "az." means azure (blue), giving the colors of the checks on the bend. "Betw. a Buck's head erazed in chief, and a cross couped and pierced, or, in base" indicates the course of the bend between the buck's head in the upper right corner of the shield ("chief") and the cross in the lower left corner of the shield. The term "erazed" refers to the jagged, broken edge of the buck's neck. "Couped" refers to the smooth edges of the cross; and "pierced" to the round perforation of it, through which the red color of the field is shown.